A very eclectic crowd showed up at Buffalo’s Mohawk Place on Friday, November 4th, made up of regulars, some older patrons, and some visible Japanophiles. The kinds of people based on visual looks you wouldn’t expect to be at the same show. 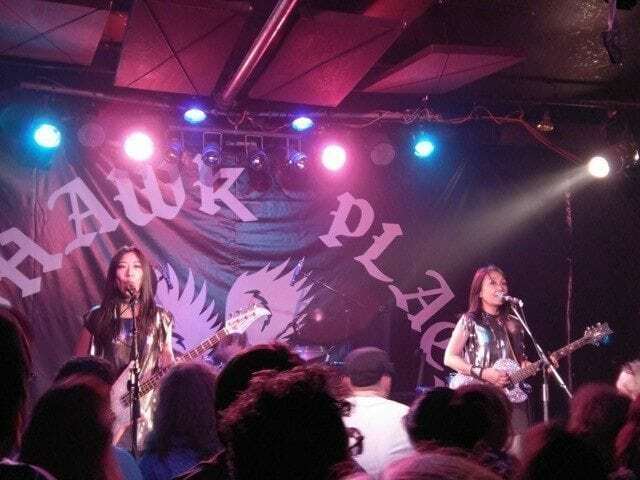 Somehow, they all came together for quite a novelty show; a Japanese all-girl garage-pop band by the name of Shonen Knife. Shonen Knife, currently made up of guitarist Naoko Yamano, bassist Atsuko Yamano, and latest drummer Risa Kawano, have had quite the long, strange history for what at first seems just like another garage band, this one just happens to be from Osaka. Since their albums got their first American release on Sub Pop records in the mid-80’s, they’ve made fans out of Nirvana, Sonic Youth, and L7, along with Matt Groening and Mike Judge. They even played some dates with Nirvana on their Nevermind tour, various festivals like Lollapalooza, Fun Fun Fun Fest, Fuji Rock Fest, and had a tribute album made for them, Every Band Has A Shonen Knife Who Loves Them, featuring underground 80’s punk acts like Sonic Youth, L7, Babes in Toyland, and the wonderfully named The Mr. T Experience. Shonen Knife does have a soft spot for Buffalo. 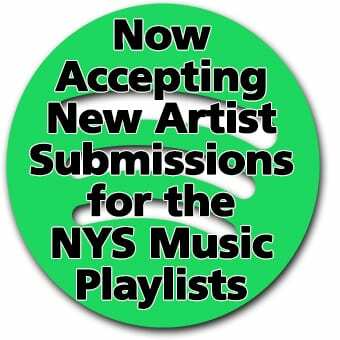 Their current American record label, Good Charamel Records, is based in Buffalo and run by Goo Goo Dolls bassist Robby Takac. They also released a live DVD at the very same Mohawk place establishment from their 2009 American tour. When they finally took the stage, after having three opening acts, Shonen Knife came out wearing dresses looking like they were flattened disco balls, playing sparkling instruments, and going straight into their fast, tight bubblegum punk songs that left a good portion of the full crowd dancing. They hardly let anyone have a chance to take a break from the fun at the frantic pace they went on at. The show lasted 75 minutes, but it somehow simultaneously felt like it passed by really quickly and took forever. All their songs are around two to three minutes, so they were able to fit quite a lot in for an average set. Not to mention getting various synchronized motions during and after the songs. Hell, there was only a few seconds of downtime between the songs, with Risa either doing a quick 1,2,3,4 on her cymbals or Atsuko shouting a 1,2,3,4. What downtime there was when they talked to the audience, in the best conversational English they could muster, was spent introducing the next song, or talking about their new album, Adventure, and it’s 1970’s influences. I suppose this next part is expected, given most American’s common perception of stereotypical Japanese music, but the song lyrics are about cute things. Like cats, complete with a “meow meow meow” chorus line, capybaras, tangerines, and how fun roller coasters are. Dare I say, the only unpleasant thing they sang about all night was wasabi. But Atsuko said she likes it before starting to sing, so maybe I’m convinced it’s gotten better since the last time I tried it. Even when the band left the stage, with the audience demanding an encore, I figured they would come back eventually. It’s a tradition at most major rock shows. But this was a small venue with everyone cramped for space, where it felt like anything could happen. So when Shonen Knife came back onstage for a two-song encore after some audience chanting, it somehow felt more earned than when it happens in an arena setting. 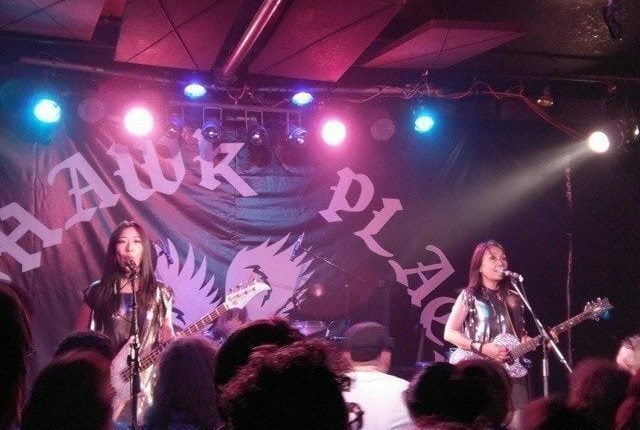 For a band with a visible American cult following, along with being around since 1981, it’s was odd for me at first seeing a band with Shonen Knife’s cred playing here, one of many Buffalo venues mainly catered toward local bands. Now I wonder if they play at any larger venues here in America, if it may ruin their mystique. I don’t blame them for wanting to play in a small, cramped space like the Mohawk Place. It just makes the fun all the more infectious, which makes for a better experience.